Adjectives are used as plural form denoting a class of persons. Some of the economists analyse the gap between the rich and the poor. Here the rich means the rich people and the poor means the poor people. Adjectives are used as singular nouns denoting some abstract quality. The future do not hold much for you. abstract noun and therefore singular. The future does not hold much for you. The adjectives derived from proper nouns become noun. You might have heard of the joke where there was an Indian, an American and a Chinese. In India, many jokes are told about the Pakistanis. Some adjectives denoting persons and things actually become nouns and are used in both numbers. Satyam was my junior at school. I then dropped and joined college after four years. There I found him among my seniors. Being an ordinary mortal, I could not tolerate his behaving as one of my superiors. I told him of his rudeness and how he did not deserve to be better than a savage. Some of my Well-wishers informed me that he had joined a gang of criminals. I remembered one of the secrets told to me by my elders: "Don't hit a snake. It will bite." This secret I treasured more than gold ornaments and other valuables. I forgot Satyam and began to read stories of kings and nobles, gather information about solids and liquids in science, and chase totals in one -day cricket. After all, I was not a minor and knew how to take care of myself. 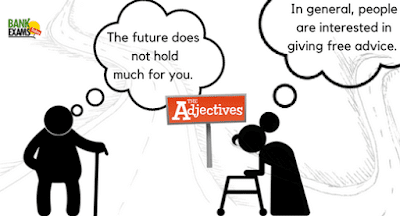 Some adjectives are used as nouns in certain phrases. In general (in most cases), people are interested in giving free advice. Teacher told the students that in future (from now on), she doesn’t want to listen to any excuses. It is not one of those books which can be read only in secret (in a private way). You will definitely benefit from saving your money before long (soon). At present (now), this is enough regarding the article. Ramesh has left smoking for good (forever). You can at best (in the most favourable conditions) restrain yourself from smoking and start doing yoga regularly. The situation got from bad to worse (even worse than before) when the ambulance which was on its way to accident site got stuck in traffic. If a friend stays with you through thick and thin (through both good and bad times), he is your good friend.